You can attempt to put many labels on the Sultans of String, but ultimately either you will run out of space or none of the labels will fit. The group is genre-bending, a collision of so many artistic cultures that their musical atlas seems infinite. They can do so many musical things and the best thing about that is they get away with it. They are superb musicians, to a man – not just virtuosos but intuitively each is a sublime artist. So it is natural to expect the unexpected and you will never be disappointed. 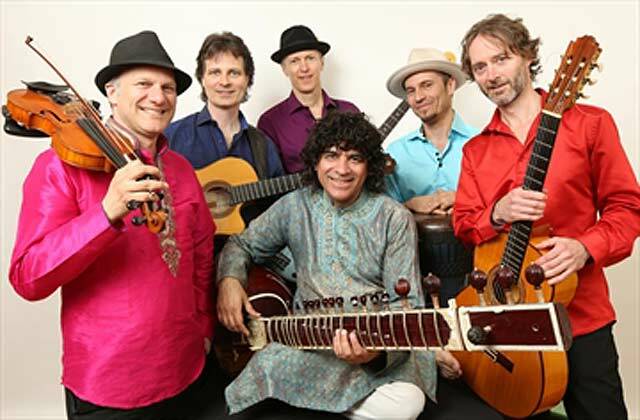 Rousing moments abound in Subcontinental Drift, the varied programme of works that the Sultans of String have put together with the renowned Indian sitar player, Anwar Khurshid. But the moments that truly seize the ear are hushed passages in which the ensemble does a mesmerising job of suspending time (and leaning into musical suspensions with subtle expertise). Such expressions of near sacred devotion are striking on Subcontinental Drift which moves through slowly evolving harmonies, and the profoundly beautiful A Heart Does What it Does, a piece of truly reflective beauty. Magic also unfolds in Snake Charmer, in long, poignant lines, while Chris McKhool and Kevin Laliberté juxtapose extended and ornamental phrases with the rapturous playing of Anwar Khurshid almost continuously through the repertoire. Among the disc’s 10 selections are also classic pieces of rhapsodic beauty such as Ho Jamalo and Parchan Shaal Panhwar. But it is not simply the Indian repertoire that is enchanting. Listeners will fall prey to the charms of all of the repertoire on this wonderful album. 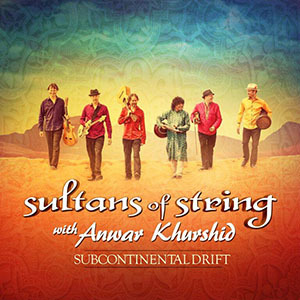 Amid the serenity of the choir and Anwar Khurshid’s sitar the Sultans of String weave music of unbridled joy and celebration. Even the melancholic Blowin’ in the Wind is turned into a work of great expectation and therefore something truly joyous. The Sultans of String bring textural clarity, finesse and fine thrust to the scores, driving several sections to the edge of earthy mayhem. Their playing has exceptional point and inner tension and the various layers of the music are balanced to superb effect. Remarkably all of the musicians savour the scores’ forays into folk and classical Indian sources that Anwar Khurshid brings to the table and he, in turn, partners with the Sultans of String in readings that are by turns sweeping, luscious and rousing. You can almost imagine a troupe of classical dancers from around the subcontinent trying to catch their collective breaths as they negotiate some of the propulsive tempi taken here. Speaking of tempi the percussionists, Rosendo “Chendy” León and the tabla master Ravi Nampally also do a remarkable job weaving their cross-cultural rhythms into a fine fabric that lies abed with the harmony of the rest of the Sultans of String led by Chris McKhool and Kevin Laliberté. Together the passion of the artistry is palpable and that includes the chorus whether they are whispering or lifting voices to the skies. Track List: Enter the Gate; Rakes of Mallow; Rouge River Valley; Ho Jamalo; A Place to Call Home; Blowin’ in the Wind; Snake Charmer; Parchan Shaal Panhwar; Journey to Freedom; Subcontinental Drift; A Heart Does What it Does. Personnel: Chris McKhool: violin, viola, chin-cello and vocals; Kevin Laliberté: nylon string, steel string and electric guitars, and vocals; Eddie Paton: nylon string and steel string guitars, and vocals; Drew Birston: acoustic and electric bass, and vocals; Rosendo “Chendy” León: drums, percussion, palmas, jaleo and vocals with Anwar Khurshid: sitar and vocals and guests: Ravi Nampally: tabla; Shweta Subram: vocals (7); Waleed Abdulhamid: vocals (3); Choir: Amoy Levy, Ciceal Levy, Adrienne McKenzie, Camille Harrison, Nevon Sinclair and Danah Martin.